One of the gifts. 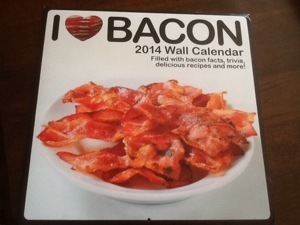 I received for Christmas was a 2014 bacon calendar! I know pretty awesome, but it gets better. This calendar comes with recipes, fun facts, photos, and more! 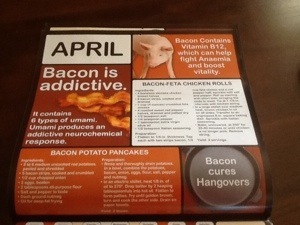 So today I bring you some bacon fun facts in celebration of this awesome calendar! Starting the day with a high protein, high fat breakfast such as bacon and eggs improves metabolism and further facilitates circulation and digestion! 70% of all bacon in the U.S. is eaten at breakfast; and 59% of bacon is consumed on weekdays! Bacon is addictive! It contains 6 types of umami, umami produces an addictive neurochemical response. Women who are pregnant should eat bacon! Bacon contains choline which helps in fetal brain development. Three slices of cooked bacon contains about 100 calories! And almost half of the fat in bacon is “good fat” that can help lower cholesterol (all in moderation). The B.L.T. name came from a waitress who used shorthand to speed up orders! I hope you know feel like a bacon whiz, I think I might go try out a new bacon recipe…or three!